As I laid awake in the 1920 bungalow where I lived at the time in Old North Durham, I could barely hear the radio over the sound of windows rattling and the loud ruffling of the soft-top on my Jeep Wrangler parked a few feet away on the street before a huge urban street tree. As the clock struck midnight on September 5, 1996, the radio newscaster announced that Hurricane Fran, my first-ever, was not skirting the coastline, as most do, but headed 170 miles inland, straight up I 40 toward my adopted hometown of Durham, North Carolina just as some of my community-destination marketing colleagues at the time were rushing into the eye of the storm to get home from a sales mission. The huge Category 3 storm roared directly over my little house and its adjacent forest at about 3 am that morning taking down a huge portion of Durham’s beloved tree canopy, knocking out power to much the community, flooding storm drains, sending water flowing over stream and river banks as well as bridges and leaving many roads impassable. Day-break on September 6th brought a beautiful and eerily still and humid morning. In this part of North Carolina, two decades of polling shows that nearly eight out of ten people characterize where they live by the name of a specific city, town or county. For the next largest group, it is a specific neighborhood, with only a tiny fraction citing an amorphous region. That morning, my world was distilled down to only next door neighbors and my block on Shawnee Street. Maneuvering the Jeep around downed trees and other obstacles, I slowly migrated with others to a friend’s house in the adjacent Trinity Park neighborhood of Durham. Friends gathered throughout the day and into the night as my friend, then a restaurateur, used his outdoor grill to cook virtually everything from his and his neighbors’ freezers and coolers before the food could spoil without electricity. Twenty-six people lost their lives to “Fran,” as have more than 1,000 North Carolinians to hurricanes dating to before 1700. 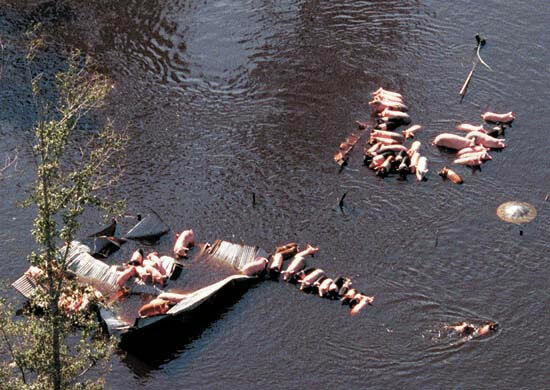 The deadliest, Hurricane Floyd, would come three years after Fran and was recorded with indelible images taken from helicopters of thousands of pigs as they floated above roofs on flooded down-east farmsteads, leaving a memory that my mother, in the Pacific Northwest, still associates with North Carolina. As Floyd churned north it also flooded the first floor basement and recreation room of the apartment where some friends of mine lived in Basking Ridge, New Jersey at the time, forty miles east of New York City. The heavy rains that accompanied that huge, slow moving storm overwhelmed storm run off systems and the flooding destroyed everything they had accumulated including invaluable photographs and family heirlooms. I had only lived six years in Durham, or anywhere east of the Rockies for that matter, when Fran hit. I was into my 24th year here when Hurricane Sandy, a Category 1, veered overland in the northeastern United States on October 29th this year, passing again directly over Basking Ridge at approximately the same time in the wee hours of the morning that Fran did over my little house in Durham 16 years ago. We haven’t learned many lessons since Fran. FEMA has learned and the Corp of Engineers has learned as have emergency officials in some states, but utility companies are still in denial, insisting it is too expensive to bury power lines even in view of the renewed devastation in Basking Ridge. That’s only because utility companies haven’t factored into the market the vastly greater costs that come with storms and outages in general when power lines have not been moved underground. Florida utility regulators have persuaded utility companies there to cooperatively track storm-related costs. If they haven’t already, I can see New York and New Jersey doing the same. In fact, maybe a silver lining in New York City’s devastation is that Wall Street and Madison Avenue will join forces to finally persuade utility companies to begin burying all utility lines. While they are at it, they should also take on climate-change deniers. Even for “ready-aim-fire” types such as myself, change doesn’t begin with “analyze-think”, it begins with “see-feel” to use terms coined by authors John P. Kotter, a Harvard business professor and Dan S. Cohen in their book The Heart of Change. In my experience over 40 years as a community-destination marketing executive where I took on a multitude of challenges including Durham’s image turnaround, before my retirement several years ago, I found that analysis, rationale and measurement are important to executing change, but the passion, determination and grit crucial to initiating change always begins with seeing and feeling. The costs that come from the refusal of utility companies to bury power lines is not the only “negative externality” or transaction spillover that economists and market analysts should insist be computed into costs rather than pushing them off on society. They also rob communities of the economic benefits of street tree canopies. More states such as North Carolina need to emulate the cooperation demonstrated between Florida’s electrical utility teams and academics and policymakers including Ted Kury, an economist and director of energy studies at the University of Florida’s Public Utility Research Center, which has developed a simulation tool to help utility companies assess and make much more enlightened decisions about undergrounding power lines. Maybe, just maybe, the experience of those still recovering from Hurricane Sandy can finally begin to shift this paradigm.